As San Francisco kids head back to school on August 15th, they probably won’t realize that their school meal program currently has no leader. Meals still come from Revolution Foods, and while a few cafeterias may be showing off a new look, the heart of the program – the food – remains the same. And that’s a problem, because over the past few years, the number of students eating school meals has been dropping for both breakfast and lunch, even as efforts have been made to drive those numbers higher. Switching from a frozen, reheated meal prepared thousands of miles away, to a healthy Revolution Foods meal freshly prepared right here in the Bay Area, has not been enough to get more kids to opt into the meal program, and the long-held goal of scratch cooking remains out of reach. SFUSD has been trying to recruit a new Director for Student Nutrition Services (SNS) since last spring, but thus far the right person for the job has not appeared. That’s why I was so excited to read about what Joe Urban, Director of Food and Nutrition Services for Greenville County Schools in South Carolina, is doing with his program. Operating in 101 schools and special centers, and serving a population of about 75,000 students (about 52% of whom qualify for government subsidized school meals), Greenville is roughly comparable in size to SFUSD, which has just over 100 K-12 schools enrolling approximately 58,000 students (about 56% qualifying for government meals in 2015-16). But while page 50 (Vol.II) of the SFUSD budget for 2016-17 shows that SNS served about 7450 breakfasts per day in 2015-16 (down from 7600 the previous year) and about 19,500 lunches, Joe Urban served 18,000 breakfasts and 55,000 lunches that year. That means that while only about 13% of SFUSD’s students started the day with a healthy school breakfast, 24% of Greenville’s kids did, and for lunch, while about 34% of SFUSD kids chose a cafeteria meal, in Greenville, cafeterias served a full 73% of students. Yow! Who is this guy that has been able to get twice as many of his students to eat school meals as SFUSD? Urban has been working in foodservice for over 30 years, first making pizza in a family restaurant, then managing a Pizza Hut franchise. That’s how he learned about customer service and what it takes to be successful in the very competitive food service industry. He owned a diner for 15 years before moving to Greenville with his family. Among the accomplishments he is most proud of are moving to scratch cooking, serving only whole fresh fruit (never canned), using only whole muscle meat chicken (not that chopped and formed glop so often found in processed nuggets and patties), and offering universal free breakfast for all Greenville students. While SFUSD years ago switched to fresh fruit and whole muscle meat, the long held goals of scratch cooking and universal free breakfast remain stubbornly out of reach. Current menus for SFUSD are posted here, while Greenville’s menus are here. Many of the lunch entrees look pretty similar (although Greenville offers homemade soup 3 times a week); the main difference is that in Greenville, nearly everything is scratch cooked right in the schools. I spoke with Urban about the unique challenges that SFUSD faces, how to move from a costly outside vendor to an internal, scratch cooking program, and how to get more kids to eat. Q.- School breakfast is an important issue for you. SFUSD offers Breakfast in the Classroom (BIC) or Second Chance Breakfast in some schools, but despite these additional efforts, the number of students eating school breakfast per day actually dropped from 7600 2 years ago, to 7450 last year. This means only about 13% of SFUSD students ate school breakfast in 2015-16. Last year, there were 45 non-charter SFUSD schools with over 70% of students qualified for free or reduced price meals, but only 21 schools had free-for-everyone breakfast like BIC or Second Chance, according to the district’s website. What advice do you have for how to get more students eating breakfast? A– Have you considered Universal Free Breakfast for all schools with at least a 70% free and reduced population? This model scares a lot of districts because they are afraid that increasing paid student participation without receiving the student portion of the payment would result in a negative revenue situation. In reality, you will probably increase a small percentage of the paid students, but you will realize a tremendous gain in the free and reduced student participation. By removing the stigma of school breakfast, more kids who actually need it will participate (along with a few paid students). You have a very diverse population; are you serving the breakfast items these kids may receive at home? Start polling parents and students to see what they really want for breakfast. Regardless of your efforts to make breakfast available, if the choices do not match student preferences, you are dead before you even get started. Work with school student council members to solicit ideas, or even allow them to create a cycle menu based on their preferences. Sample, sample, and sample: invest the time and money handing out samples of the items the students chose as students arrive to school. You need district administration, Principal, and teacher buy in. They need to understand the correlation between students eating a healthy breakfast in relation to attendance, behavior, and visits to the school nurse. We have been able to document tremendous gains in these areas with our BIC programs. Q.- A follow up question: last year SFUSD paid about $1.20 per breakfast from Revolution Foods (like cereal or a muffin, and fruit), plus about 25 cents more for milk. Setting aside other costs (like delivery, or even labor to serve), that means a total food cost of about $1.45 per meal. The payment SFUSD received for a student qualified for free breakfast was $1.99 (the severe need rate) from the federal government, plus just under 23 cents from the state, or a total payment of just under $2.22. That means that in 2015-16, SFUSD was spending about 65% of its breakfast revenue just on food. That seems high; any suggestions for how to get those food costs down? A– Reliance on Rev Foods for breakfast items with such a high food cost is not a good plan. Even if scratch making breakfast is not an option, there are plenty of high quality individually wrapped products that can be procured and paired with milk and fresh fruit (or fruit juice) that require very little labor to assemble and would result in a food cost of less than $1.00 per meal. There are some decent products out there that meet 2 grain or 1 grain/1 meat federal breakfast requirement that you can buy for around 50 cents each. An alternative method (and I am not sure if this is within SFUSD’s abilities) is to utilize a central warehouse/kitchen where quality, pre-made individually wrapped items could be brought in, stored, assembled, and delivered to schools. Q- The number of SFUSD students eating school lunch has also been in freefall for the past few years, dropping 16% from March 2013 to last spring; that’s a big drop in revenue. Additionally, with fewer meals served, the amount of low cost commodity food available from the government in subsequent years drops too, driving up future food costs. 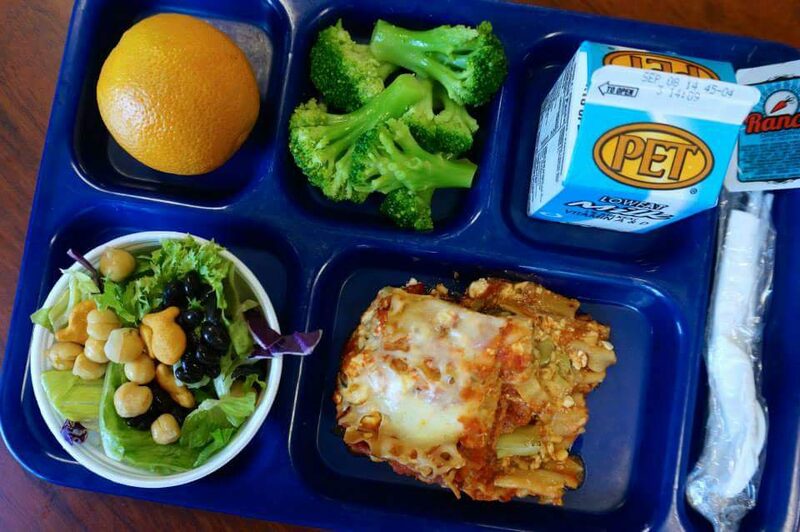 What are the best ways to get kids to eat school meals? A– Increasing student participation is only possible when you are menuing items that students want to eat. Are the Revolution Foods meals served indicative of what the students are getting at home? If not, they should be. Today’s kids are sophisticated. Although they are probably one of the better pre-packaged offerings available, Rev Foods packaging still screams TV dinner. Students want REAL food cooked well. It appears that not all of your kitchens are equipped well enough to handle on-site cooking of quality school meals. Equipping your kitchens and training your cafeteria staff to prepare the types of meals your customers demand is a first step that needs to be considered. SFUSD must invest in kitchen equipment for the schools or invest in one (or more) fully equipped centralized cooking facilities. Q- You do a lot of scratch cooking in Greenville, but SFUSD has neither a central kitchen nor dedicated warehouse space for student nutrition, and for the past several decades, has been relying on precooked meals from outside vendors. There is a school facilities bond on the November ballot that would pay to renovate some SFUSD high school kitchens to turn them into regional kitchens cooking meals for all the nearby schools. What are your “best practices” for moving a school district from heat and serve to scratch cooking? A– In addition to what I have talked about above, including intensive training for the cafeteria staff, it is important that a culture exists where serving healthy scratch made meals is the expectation. This needs to first start with the Superintendent. Without buy in from that level and a very strong Student Nutrition Director (and district office staff), it will never be successful. Resource sharing with other like minded districts can be helpful. Districts like mine already have volumes of student tested recipes that meet USDA regulations and would be willing to share. While not all of Greenville’s recipes would work for SFUSD, many of them would and so would many from other districts. The hard work of developing recipes and running nutritional analysis is already done. Q- SFUSD is in the process of searching for both a new District Superintendent and also a new Director for the Student Nutrition Services department. Given that it is impossible to know at this point how important the issue of school meals may be to the next district Supe, and given the challenges SFUSD faces to move to scratch cooking, and to get more kids to eat, what qualities do you think will be needed in a new Student Nutrition Director? A– First, I looked at the salary schedule posted AND the incredible cost of living in the Bay Area. I believe you will have a difficult time finding the right person for the position given that salary. While the top end of that salary is good for many areas of the country, if the average cost of housing in the Bay Area I am reading on the internet is accurate, it is not nearly enough. I can’t imagine anyone who was truly qualified for this position considering it for less than $150-$160,000. Qualities you should be looking for are a director with a passion and proven record of transforming school food, someone with proven leadership skills in tremendously difficult situations, someone with a proven record of financially turning around a very large foodservice operation, someone that has a proven track record building relationships with administration and community partners. Q- Do you have a philosophy regarding school meals and students? A– Yes, #SchoolFoodRocks. It is our privilege to be in a position where we can reinvent school food and teach our students that school food can be healthy and delicious. Our students deserve the highest quality food that we can serve them. We constantly set new goals for our program and as soon as we achieve those goals we set new ones. We are never satisfied with being the best school foodservice around; we are always on a mission to be better than we were yesterday. This philosophy has shown us that there are no limits to what a school foodservice program can be. We are only limited by our imagination and our efforts. After talking with Urban, I was ready to offer him the job on the spot (and at the salary he says is necessary). But there’s more. If Urban’s accomplishments in Greenville school kitchens were not enough to recommend him for the job in SFUSD, how about the ability to inspire kids to learn about and insist on healthy food? This is exactly the kind of leadership that SFUSD’s Student Nutrition Service needs, and our students deserve. Joe Urban is not available (he told me he was committed to staying in Greenville), but his example should be kept in mind when candidates for the job are being interviewed. SFUSD should settle for nothing but the best when it comes to feeding our most precious resource, our kids. To learn more about the incredible school food being served in Greenville, SC check out the Greenville County Schools Food and Nutrition Services Facebook page at https://www.facebook.com/gcsdFANS/ and follow them on Twitter @SchoolFoodRocks.